James Cleveland "Jesse" Owens (September 12, 1913 – March 31, 1980) was an American track and field athlete. He participated in the 1936 Summer Olympics in Berlin, Germany where he achieved international fame by winning four gold medals; one each in the 100 meters, the 200 meters, the long jump, and as part of the 4x100 meter relay team. Owens' stunning success was a devastating blow to the propaganda hopes of Adolf Hitler and the Third Reich's racial theories. Owens was born in Danville, Alabama, in 1913. His family moved to Cleveland, Ohio, when he was eight years old as the last of the ten children of Henry and Emma Owens. Owens was the grandson of a slave and the son of a sharecropper. He was often sick with what his mother reportedly called "the devil's cold." He was given the name "Jesse" by a teacher in Cleveland who did not understand his accent when the young boy said he was called "J.C."
Cleveland was not prosperous for the Owens family; they lived very poorly. Jesse had to take different jobs in his spare time. He delivered groceries, loaded freight cars and worked in a shoe repair shop. It was during this rough period that Jesse realized he had a passion for running. Throughout his life, Owens attributed the success of his athletic career to the encouragement of Charles Riley, his track coach at Fairview Junior High, who had put him on the track team. Since Jesse worked in a shoe repair shop after school, Riley allowed Jesse to practice before school instead. 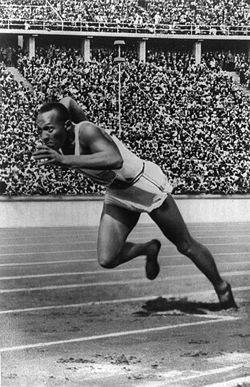 Owens first came to national attention when, as a student of East Technical High School in Cleveland, he tied the world record of 9.4 seconds in the 100-yard dash and long-jumping 24 feet 9 1/2 inches (7.56 m) at the 1933 National High School Championship in Chicago. Owens attended the Ohio State University only after employment was found for his father, ensuring the family could be supported. He was affectionately known as the "Buckeye Bullet," and he won a record eight individual NCAA championships, four each in 1935 and 1936. His record of four golds at the NCAA was only equaled in 2006, by Xavier Carter, although Carter's titles also included relay medals. Despite all of Jesse's success, he was forced to live off campus with other African American athletes. When he traveled with the team, Jesse was required to either order carry out or eat at "black-only" restaurants. Likewise, he slept in "black-only" hotels. Jesse Owens was never awarded a scholarship, so he continued to work part-time jobs to pay for school. Owens's greatest achievement came in a span of 45 minutes on May 25, 1935, at the Big Ten Conference Meet in Ann Arbor, Michigan, where he set three world records and tied a fourth. He tied the world record for the 100 yard (91 m) dash (9.4 seconds) and set world records in the long jump (26 feet 8¼ inches, a world record that would last 25 years), 220 yard (201 m) dash (20.3 seconds), and the 220 yard low hurdles (22.6 seconds to become the first person to break 23 seconds). This incredible feat is widely considered one of the most amazing athletic achievements of all time. In 2005, both NBC sports announcer, Bob Costas, and University of Central Florida Professor of Sports History, Richard C. Crepeau chose this as the most impressive athletic achievement since 1850. Jesse Owens Memorial Stadium was completed in 2001 on The Ohio State University campus. It is a multi-sport facility that hosts the university's varsity track and field, lacrosse and soccer teams. In 1936, Owens arrived in Berlin to compete for the United States in the Summer Olympics. Adolf Hitler was using the games to show the world a resurgent Nazi Germany. He and other government officials had high hopes German athletes would dominate the games. Nazi propaganda promoted concepts of "Aryan racial superiority" and depicted ethnic Africans as inferior. Owens surprised many by winning four gold medals: On August 3, 1936, the 100m sprint, defeating Ralph Metcalfe; on August 4, the long jump, after friendly and helpful advice from German competitor Lutz Long; on August 5, the 200m dash; and, after he was added to the 4 x 100m relay team, his fourth on August 9 (his performance wasn't duplicated until Carl Lewis won gold medals in the same events at the 1984 Summer Olympics). The runner he beat in the 200m at the 1936 Summer Olympics was Jackie Robinson's brother, Matthew "Mack" Robinson, who also tied the world record at the time. On the first day, Hitler shook hands only with the German victors and then left the stadium (some claim this was to avoid having to shake hands with Cornelius Johnson, who was African-American, but according to a spokesman, Hitler's exit had been pre-scheduled). Olympic committee officials then insisted Hitler greet each and every medalist or none at all. Hitler opted for the latter and skipped all further medal presentations. After the games he had difficulty making a living and became a sports promoter, essentially an entertainer. He would give local sprinters a ten or twenty yard start and beat them in the 100 yd (91 m) dash. He also challenged and defeated racehorses although as he revealed later, the trick was to race a high-strung thoroughbred horse that would be frightened by the starter's pistol and give him a good jump. His self-promotion eventually turned into a public relations career in Chicago, including a long stint as a popular jazz disc jockey there. In 1968, Owens received some criticism for supporting the racially turbulent XIX Olympic Games that year. Jesse left Ohio State his senior year to run professionally, and took on numerous speaking engagements. Jesse traveled the world and spoke to companies like Ford Motor Company and the United States Olympic Committee. He would always stress the importance of religion, hard work, and loyalty. A pack-a-day smoker for 35 years, he died of lung cancer at age 66 in Tucson, Arizona. Owens is buried in Oak Woods Cemetery in Chicago. A few months before his death, Jesse Owens tried unsuccessfully to convince President Jimmy Carter not to boycott the 1980 Olympics held in Moscow, arguing that the Olympic ideal was to be a time-out from war and above politics. The Jesse Owens Foundation provides information, materials, and direction for research on the life and legend of Jesse Owens. It is governed by a Board of Directors with oversight provided by a Managing Director. The Foundation is supported by special events and contributions from the community at large. Since 1983, the Foundation has provided more than 350 young people, throughout the country, with support for their college education. Jesse Owens was awarded the Presidential Medal of Freedom in 1976, by Gerald Ford and the Congressional Gold Medal (posthumously) by George H. W. Bush on March 28, 1990. In 1984, a street in Berlin was renamed for him and the Jesse Owens Realschule/Oberschule (a secondary school) is in Berlin-Lichtenberg. His birthplace in Oakville dedicated a park in his honor in 1996, at the same time the Olympic Torch came through the community, 60 years after his Olympic triumph. Two U.S. postage stamps have been issued to honor Owens, one in 1990 and another in 1998. ↑ Jesse Owens Homepage, [www.jesseowens.com/jobio2.html Job Bio.] Retrieved November 8, 2007. ↑ Lacey Rose, The Single Greatest Athletic Achievement. Retrieved November 8, 2007. ↑ Hyde Flippo, The 1936 Berlin Olympics: Hitler and Jesse Owens. Retrieved November 8, 2007. ↑ As quoted in "Owens pierced a myth" by Larry Schwartz in ESPN SportsCentury (2005). This page was last modified on 4 May 2018, at 15:56.